How is Scranton Roy able to suckle a baby? What does his ability to do so suggest about Erdrich's view of gender roles? How is Scranton's act different from Blue Prairie Woman's suckling of a puppy? Is Scranton's ability to lactate meant to be a realistic or a magical act? Are the male characters in this novel realistically portrayed, or are they, as one scholar has suggested, merely pasteboard cutout figures? Does Erdrich give us enough information that we can reconstruct Cally's family tree sufficiently that we can see why she says, on page 110, "I am a Roy, a Whiteheart Beads, a Shawano by way of the Roy and Shawano proximity"? Can we trace her back to Scranton Roy? To Blue Prairie Woman? To Josephette and Mary Shawano? What is the effect of having Almost Soup narrate two of the chapters? Why, for example, does Erdrich have this dog in Chapter 9 tell the story of Cally's near-death? How would the story be different if Cally's mother Rozin had narrated that chapter? Is the dog narration part of a larger pattern of erasing the sharp boundaries between humans and other species? What do you make of the last sentence on page 73, that humans are "no more and no less important than the deer"? You will notice that Sweetheart Calico says almost nothing in the entire text. Why is that? When she finally does say something, what does she say, and why that? 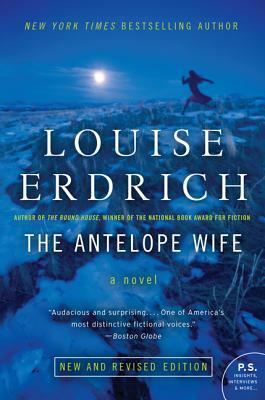 Why does Erdrich make her the "antelope wife"? Why do we have several sets of twins in the novel? What difference would it have made if all of those twins had been single births? Interspersed throughout the novel are several phrases and sentences in other languages, particularly German and Ojibwa. Do they contribute in some way to the story? Several motifs and images are repeated: broken teeth, cloth, sewing and beads, food and cooking, etc. Choose one and explain why Erdrich used it in The Antelope Wife. What is the point of the blitzkuchen story? What seems to be the secret ingredient that Frank has been searching for? On page 115, humor is said to be "an Indian's seventh sense." Is The Antelope Wife a humorous novel? Does it suggest in less direct ways that we should never take life so seriously that we forget to laugh? Why does Erdrich give us the humor of Chapter 7 (the story of Almost Soup's escape from the stew pot) immediately after the devastating story of Deanna's asphyxiation in Chapter 6? On page 174, an unnamed uncle at the "Kamikaze wedding" states "We all got to suffer. That's love." Although he is speaking specifically to Richard, Cally's rejected father, is this statement meant more generally? Erdrich could have written a simple novel. Why do you think she make it so complex? Is anything gained by having represented so many generations, races, tribes, species in one novel? The Antelope contains many references to the "pattern" made with the "beads." What larger patterns gradually emerge as the many lives and stories in the novel unfold and intertwine? On page 200, Cally says "Family stories repeat themselves in patterns and waves generation to generation, across bloods and time. Once the pattern is set we go on replicating it." What pattern or patterns are set and replicated? Does the novel suggest, fatalistically, that we can never break the patterns our past has set for us?